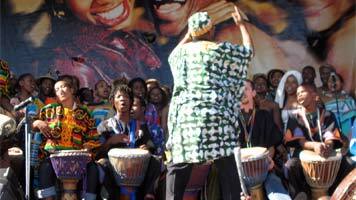 The Drum Cafe presents traditional performances, suitable for a modern performance context. The traditional performances that we offer include the playing of traditional instruments as well as other elements of traditional song and dance. Our performers, dressed in authentic costume, showcase the music of South African ethnic groups and some of the near-extinct instruments they use. At the essence of African community is the belief that the individual identity is a function of the collective relationship. And traditional music, by its very nature, nurtures the idea of ubuntu – a South African concept that refers to sharing and relationships in community. Choose a performance from one specific group or we can give you a taste of a variety of South Africa’s ethnic groups in one show, celebrating each group’s uniqueness and our country’s diversity. You can choose from existing performances or we can tailor-make the performances. We invite you to experience a slice of the culture of the Ndebele people, renowned for their vibrant murals, beadwork and beautiful multilayered clothing. The female dance is shaped by their heavy beading that covers almost the entire body, and their movement is constricted by the thick leg bangles that cover the length of their leg. Performers use very small movements when they dance, swaying their bodies slightly and shifting their weight from one foot to the other. More focus is placed on arm movements, and women sometimes hold small painted wooden axes, which they thrust in front of their bodies. Xhosa music is exceptional for its use of overtone singing, which is practiced and performed by women and distinguished by its low and intricately textured sounds. Witness the distinctive Xhosa dance with its overt shoulder movements, and hear the surprising sounds that come from Xhosa bow instruments, including the umrhubhe friction mouth-bow and the uhadi. 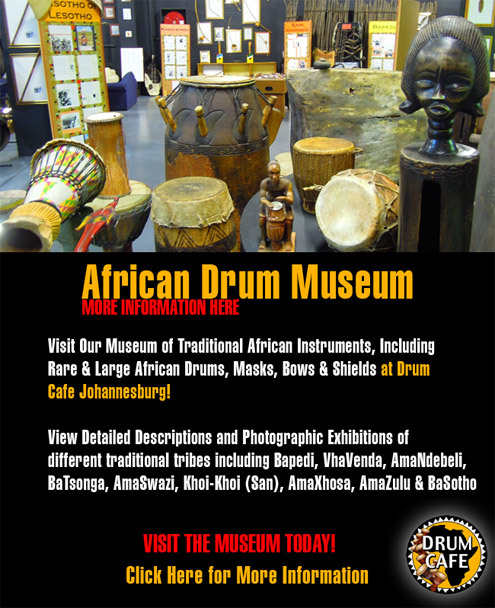 The Drum Cafe brings you plumes and shields, warriors and beads – the best of authentic Zulu drumming, song and dance. Experience the Zulu’s synchronized stamping of the feet into the ground, the Ndlamu dance as well as various other Zulu dance styles. We offer all-male, all-female performers or mixed male and female performers. 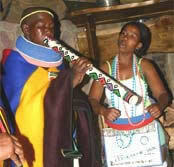 We also bring you isicathamiya (male acapella music made famous by Ladysmith Black Mambazo) and maskanda guitar music. The Drum Cafe brings you the best in music and dance of the VhaVehenda - a nation of spirit and magic, mists and forests, myths and legend. We present the female python dance – Domba, as well as the tshikona reed-pipe dance. In the tshikona dance, each dancer - dressed in animal skins, feathers or bright Venda materials - plays the pipes while performing intricate dance-steps. Other Venda performances include the female Tshigombela and Malende dances. The Drum Cafe’s Basotho performers wear Seshweshwe, which are colourful German-print cloths. Discover the sounds of the lesiba, the Basotho national instrument with its harsh, bird-like sounds. The mokhibo, known as the ‘knee’ dance is another favourite. Picture Sotho women on their knees, moving in unison with short lengths of wood in their hand and dressed in colourful costume. Our performers eloquently present difela, male unaccompanied solos with an influence of praise poetry. Be treated to an ancient culture untouched since the dawn of time with the enchanting Tswana/ San performance, as our performers, clad in traditional animal skins, relay themes of nature and imitate animals through dance, clapping and song. We offer all-male, all-female and mixed groups. Witness the ancient and powerful San trance dance with its healing properties and remarkable similarities to modern rave dance. Central to San philosophy is their search for transcendence and desire to experience altered states of consciousness. The women clap and sing to help the dancers reach a trance and soon the dance becomes frenetic. The Drum Cafe is a proud sponsor of the Mzantsi Traditional Orchestra the first-ever South AfricanMzantsi Traditional Orchestra, ideal for grand openings, launches and media events. The intention behind the Orchestra is to bring together traditional instruments, song and dance to promote and preserve indigenous African music in all its diversity and help create awareness of the vital importance of cultural continuity. The Drum Cafe pays tribute to the African oral tradition in the form of praise poets in the South African language of your choice. We provide general poems of praise or can custom-make a poem geared to the occasion. The poem can be integrated into other performances. We can combine praise poetry with storytelling, rap, modern instruments, modern-day poets and bands in an exciting fusion performance. 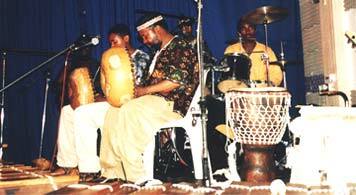 Remember to read about the Drum Cafe’s wide array of performances, including Marimba , Gumboots, Dance, Jazz/World Music, Party Bands, DJs and MCs, Mzantsi Traditional Orchestra, Carnival and Circus Acts and Fusion/Crossover. We can combine traditional music and dance with a selection of our other performances.